Want to receive - and react to - SMS and MMS messages on a LinkIt ONE? We'll help you do just that today, using Twilio's Programmable Wireless and Amazon Web Services' IoT, API Gateway, and Lambda. Upon receiving an incoming SMS or MMS, a Twilio number will trigger a Webhook that sets our infrastructure in motion. If you haven't done so yet, run through our guide on sending SMS or MMSes with the LinkIt ONE and Twilio Programmable Wireless. We'll be building on top of the same infrastructure in this post, and will assume you have it in place. As before, this code will work with either Programmable Wireless or WiFi. Already ran through the last guide? Awesome, let's let the LinkIt talk back! We're going to turn the architecture from the sending article on its head for this objective. Now, when Twilio receives and incoming message, it will post to an endpoint you expose with API Gateway. API Gateway will trigger Lambda, which we will give permission to post directly to the twilio topic on MQTT. Remember, the LinkIt ONE is already subscribed to the MQTT twilio topic; we simply need to add some business logic which reacts to incoming messages. We can then respond in the same way we did in the sending guide - by using the Lambda send message function. 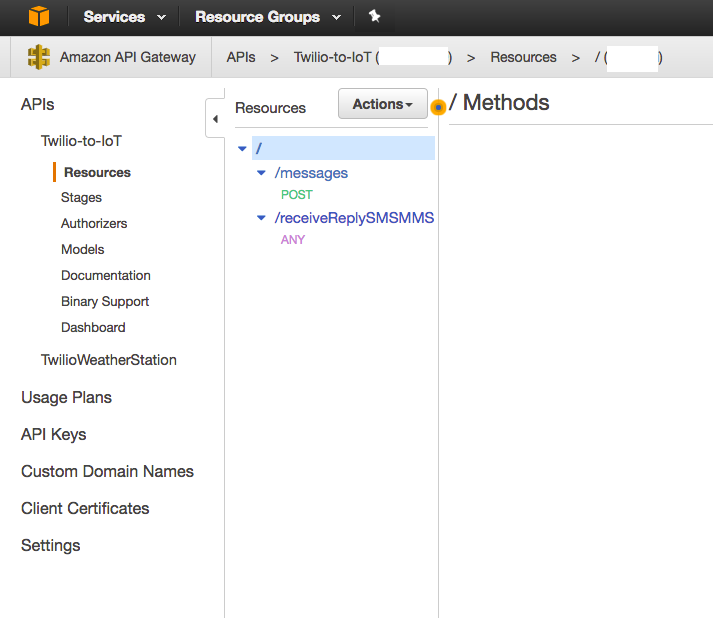 We’re going to use Amazon’s API Gateway to expose the endpoint Twilio will hit when it sees incoming messages. Great stuff! You've not got a mock endpoint set-up. We'll eventually return here to add the logic we need to receive and reply to Twilio, but for now, you're done. Next, we're going to move on to Lambda. In the sending messages article, we created a simple function which POSTed to Twilio after receiving carefully constructed MQTT messages. For receiving messages, we're going to do roughly the opposite, and forward incoming messages back to the LinkIt over the same channel. Again, this is quite a few steps, so we've condensed them to make them easier to follow. 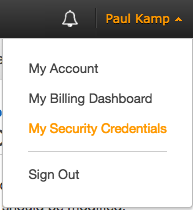 Receive a text message with AWS Lambda then pass along the data to a MQTT topic. As a message comes in from Twilio, we quickly do some checks for validity, message size, and the like. On an embedded platform you'll want to do a lot of this on the server. Of special note, you can see we're checking for the existence of the X-Twilio-Signature header. This signature is a hash of the POSTed form plus your API Secret, which you can find in the Twilio console. See more about how Twilio helps you secure incoming requests. For now, that's all you'll need to do on the Lambda side. However, we're not quite finished with this specific functionality. You need to give a user some new permissions. We're using the boto3 package and trying to publish directly to the twilio MQTT topic in whichever region you set in the environmental variables. However, if you ran this now... you'd have no luck. Let's fix that. And with that, Lambda can now publish to the twilio MQTT topic. Let's return now to API Gateway and build out our mock API. By default, API Gateway is made to handle JSON data. Twilio expects, however, to be able to POST form data and to receive XML in the form of TwiML. These next steps will both ensure our Lambda function is called, as well as change the API Gateway defaults to handle form POSTs as well as XML. Ready to dive in? We've carved up the steps for you to follow once again. 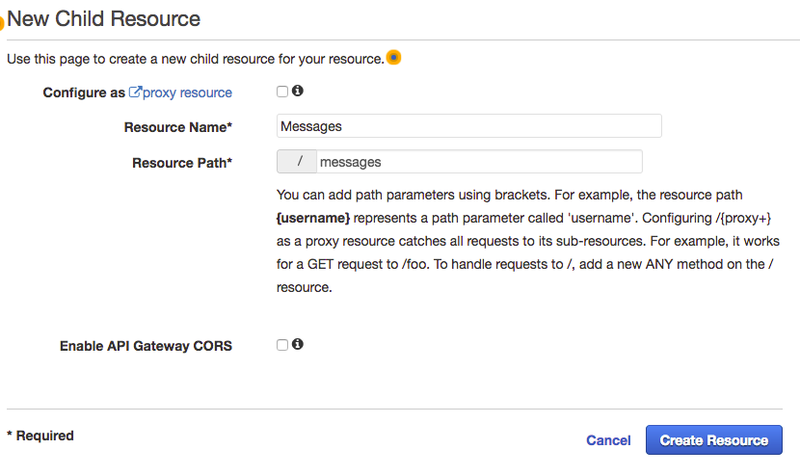 Start by heading back to the API Gateway Console. At this point, we need to add back the Lambda integration. Here we’re taking every POSTed parameter and mapping it to JSON to pass to Lambda. In Lambda, you'll recall, we use the POSTed parameters to validate requests are from Twilio. To validate incoming requests, we need to pass along the X-Twilio-Signature header as discussed above. Let's add that now. When Twilio hits your endpoint, it expects XML in return. Now, let's modify the API to return that XML. Click ‘Add mapping template’ and add ‘application/xml’. We are simply passing along all data with this template, echoing inputRoot into the body. This lets us write XML directly into the body without API Gateway attempting to rewrite anything. There is one last step for our XML. We need to return application/xml when we give the all clear 200. Modify the ‘Response Body' for 200 to be ‘application/xml’. There is just a single API Gateway objective left - deploying! Make sure that you have copied the URL to the clipboard. The last step is with Twilio itself; we're going to paste that URL into the Webhook and test the integration! The last step is to change the behavior of one of your Twilio phone numbers in the console. We will set the message webhook to the URL you copied in the above step. And that's it! Power cycle your LinkIt and wait for it to connect to AWS IoT. Then text it something like 'Racecar'. We consume an incoming text message, reverse the body text, and return it to the sender over MQTT. With this guide and the guide on sending messages with Twilio's Programmable Wireless, AWS, and the LinkIt ONE, you've now got both inbound and outbound messaging working with your board.